With very few exceptions, Hip Hop anthems have their popularity, and perhaps a resurgence among a new generation of fans – then they go on to the next anthem. Not so for Souls of Mischief’s seminal classic ’93 ’til Infinity, which has remained popular for a 20-year run and counting. 50-somethings all the way down to tweens know every word to the song, which was born when A-Plus bought a dollar record by Billy Cobham (Heather) and began to sample it, adding his now-signature rhythms, drum patterns, and more. 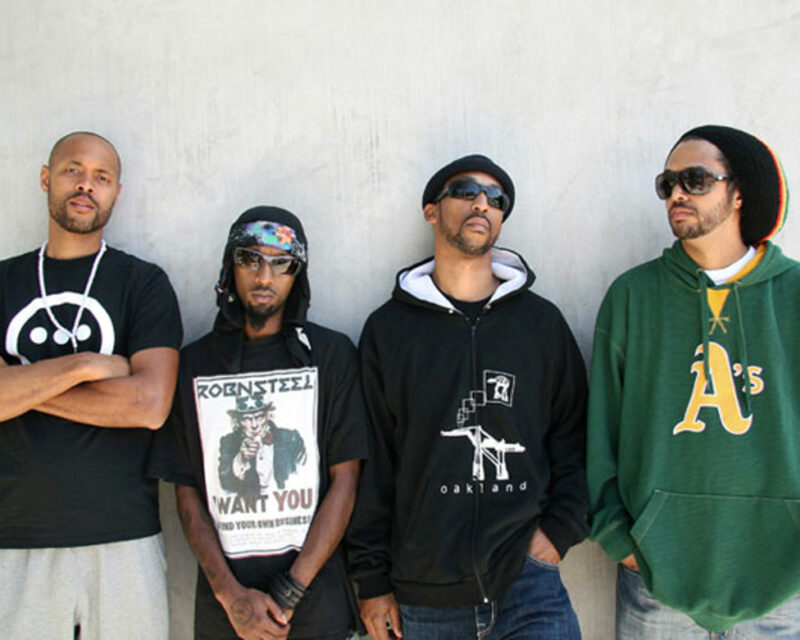 Souls of Mischief began to come together when the members were just children in elementary school. Oakland native Tajai began rhyming with future band mate A-Plus at age 8, while both were in elementary school. “My dream and goal since I was 8, was to come out with a dope hip hop album and be in the same peer group as all of the rappers I looked up to at the time. To be a part of that exclusive club of hip hop artists recognized and respected for their work,” A-Plus reminisces. 93 ’til Infinity is the group’s highest charting album to date (#17 Top R&B/Hip Hop Albums; #85 Billboard 200), and in January, 1998, was named one of the Top 100 Rap albums by The Source magazine.The group stayed with Jive for one more album, 1995’s No Man’s Land, before being released from the label during that same year. In 1995, following the release of the group from its major-label contract with Jive, the group officially formed the alternative hip-hop collective Hieroglyphics, with emcees Del Tha Funkee Homosapien, Casual, Pep Love, JayBiz, and producer Domino. The group participated as full members in both Hieroglyphics’ studio albums: 1998’s 3rd Eye Vision, and 2003’s Full Circle. Popular artists from Kanye West to Just Blaze to Vampire Weekend to John Mayer and so many more have given props and kudos to Souls of Mischief in person and in public for being a huge influence musically, style-wise, lyrically, and for the impact of their produced music. Kanye West was impressed by the group’s fashion sense and style as well. “They was like the first fresh to death group, they had the rugby’s it wasn’t about being a backpacker…they was like…the ’93 me!” From Big Sean to Big K.R.I.T. and from Vampire Weekend to P-Diddy, other producers and artists have also paid their homage by sampling the group’s music or interpolating it into their own sound. Beyond influencing popular music, Souls of Mischief was one of the first groups to have a major impact on the skate, surf & snowboard culture as well. According to Tajai, it all started when the group “got in on the 411 Video Magazine and [Plan B’s] Second Hand Smoke skate videos. That catapulted us to a whole different level. Fortunately, skaters have followed us throughout the years. We’ve got snowboarder fans and surfer fans through videos. There’s this action sports crossover. At first it seemed kind of random. But when we got on those skate videos, they were these seminal skate videos, just like our record is a seminal record for California underground hip-hop. These skate videos had guys like Jovontae Turner or Mike Carroll and they were skating in a style that was brand new.” Still making an impact to this day, the NBA is even getting in on the action. “They played “’93 ‘Til Infinity” at a Warriors game recently, and that felt good, because you’ve got 20 million people watching the playoffs on TV,” explained Tajai. All of this influence stems from five full-length albums together as Souls of Mischief, three of which were released on their crew’s self-owned indie label, Hieroglyphics Imperium – 1999’s Focus, 2000’s Trilogy: Conflict, Climax, Resolution and 2009’s Montezuma’s Revenge. In an era when most rap albums are accomplished by emailing beats and verses back and forth, Souls of Mischief’s Montezuma’s Revenge was created the old-fashioned way, with the MCs – A-Plus, Phesto, Opio and Tajai – and producers – Prince Paul and Domino – in the lab together from the beginning to the end of the recording process honing and perfecting each song to create a magnum opus. Souls spent months in the lab working on their next studio album with Prince Paul (De La Soul, Gravediggaz, Handsome Boy Modeling School). Montezuma’s Revenge, which was later released in 2009 to critical acclaim, rave reviews, and a European tour in conjunction with Carhartt brand clothing. Since 2009, Souls members have remained busy on solo projects including A-Plus’s “Pepper Spray”, Tajai’s “Machine Language”, Opio’s “Vulture’s Wisdom 2” and his collaborative album with Pep Love as First Light “Fallacy Fantasy”, and Phesto Dee’s “Background Check”. In 2013, the group is celebrating the 20th anniversary of the classic hip-hop album 93 ‘til Infinity, performing the album in its entirety with a live band on the Still Infinity Tour – hitting over 50 cities. If that wasn’t enough, Souls are preparing for the 2nd Annual Hiero Day music and culture festival in Oakland (9/2013), conducting interviews for the first-ever book on SOM, and anticipating the release of a Souls of Mischief documentary film.